Gout knee is an inflammatory condition characterised by intense pain and swelling of the knee joint. Gout is a fairly common condition affecting approximately 1-2 people in every 100, affecting one million Americans each year. Men are 2-3 times more likely to be affected than women and the peak age of incidence is 75. Gout is often extremely painful and recurrent episodes are common. As well as affecting the knee, gout can also affect the big toe, hands, toes, ankles and wrists. It tends to only affect one joint at a time rather than being widespread. If the knee suddenly becomes hot, painful, red and swollen, it is most likely due to Gout Knee. Here, we will look at the common causes, knee gout symptoms and treatment, diagnosis & prevention of gout knee, and you can even find out about famous gout sufferers! Gout knee pain develops when there are high levels of uric acid (aka urate) in the blood. 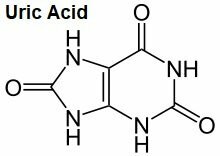 Uric acid is a waste product of many food sources. It normally passes out in our urine, but sometimes there is a problem with how the body metabolises (breaks down) the uric acid. This can either lead to the kidneys not passing urate quickly enough (causing 90% of cases), or your body produces too much urate (causing less than 10% of cases). 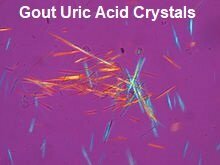 If the level of uric acid is too high, crystals can form in your soft tissues, usually around one joint such as the knee. The crystals cause an inflammatory response in the tissues leading to hot, swollen, red and painful joints. The crystals tend to form at cool temperatures, which is why gout is so common in the hands and feet. Uric acid levels are often raised for a number of years before gout knee symptoms develop. Who Is Most At Risk Of Gout? Some people are more susceptible to gout than others and there is often little correlation between the levels of uric acid in the blood and knee gout symptoms. In fact, approximately 50% of people with gout do NOT have hyperuricemia, high uric acid levels. Gout knee can develop any time after puberty, although in women, it tends to be after the menopause. This is thought to be due to the positive effect of oestrogen until then. In most cases, the symptoms of gout in knee develop rapidly over a few hours. Gout symptoms usually start at night due to lower body temperatures. The joint quickly becomes hot, swollen and red and usually becomes extremely sore. With gout knee swelling, the skin around the joint often looks shiny and there may be small, firm lumps under the skin, known as trophi. Sometimes, gout causes a fever (raised body temperature). 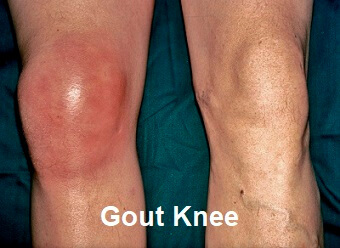 Gout knee often makes weight bearing activities such as walking and going up and down stairs incredibly painful. Your doctor can normally diagnose gout knee by from what you tell him about your symptoms and your history such as any risk factors or previous episodes. He can confirm the diagnosis of gout by doing blood tests (although these can be unreliable) or by removing a small amount of fluid from the knee joint (known as aspiration). The fluid is examined under a microscope, looking for the presence of excessive uric acid crystals. Kidney function tests may also be done to confirm the diagnosis of gout knee. Using ice to cool down the joint can help reduce gout pain and swelling. Find out how to safely and effectively use ice for gout knee and visit the ice wraps section for the best ways to apply ice. A common question with gout in knee is how long does it last? 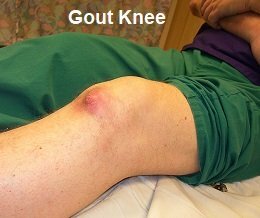 Most cases of gout knee are acute, sudden and short-lived. Left untreated, most episodes of gout knee settle down after a couple of weeks. Unfortunately, repeat episodes are common and most people will suffer a recurrence of gout knee pain anywhere from 6 months to 2 years later. 60% of gout sufferers will have a recurrence within 1 year. Are The Any Possible Complications? Sometimes, gout spreads from the knee and affects more than one joint at a time, such as the big toe or hands. There is also a risk of the uric acid causing crystals to form in the kidneys which can lead to inflammation, scarring and kidney stones. This video from Healthline talks about the symptoms, diagnosis, treatment and prevention of gout if you want to know even more. 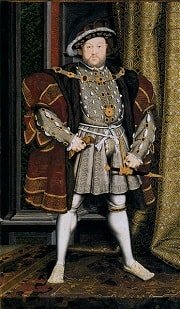 The incidence of gout has doubled over the last 20 years. 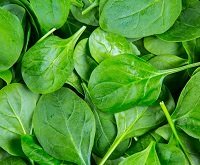 This is thought to be due to the increase in life expectancy, dietary changes and an increase in gout-associated diseases. Whilst gout knee pain is not particularly common, it should always be considered with any sudden incidence of knee pain associated with swelling and redness.